At L&R Dental, we provide many options to keep your smile healthy and attractive including tooth-coloured restorations, personalised preventive dentistry, and dental implants to replace missing teeth. Our hygienist and oral health therapist work alongside our dentists to monitor and treat periodontal conditions - an important aspect of your overall health. L&R Dental is where you will find gentle dentists providing modern, professional dentistry. 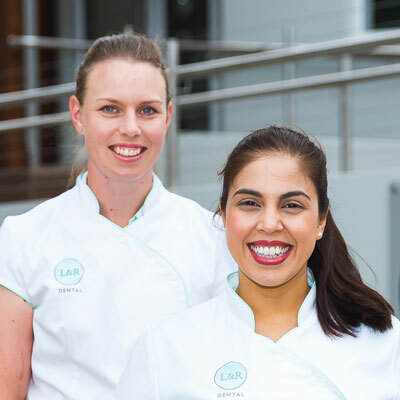 Our dentists, Dr Leanne Welsh, Dr Rachael Milford, Gina Irwin and Dr Phoebe Fernando, are dedicated to serving our local community by promoting excellent oral health to people of all ages. Because we live and work in Toowoomba, our commitment to our community is deeply personal. Each of our patients deserves nothing short of the very best. We provide personalised care designed for your specific needs as they change throughout your life and understand that having choices is important. We always present every treatment option available for you to decide what best suits your smile. At L&R Dental, our focus is to deliver modern dentistry with a compassionate, personal touch and over time, develop a deep understanding of each patient’s unique needs. We nurture long-lasting patient relationships based on mutual trust by consistently displaying our professional integrity. Our dentists are dedicated to constantly expanding their clinical skills through advanced courses and training, and have recently renovated the practice to reflect the most up-to-date dentistry available. Our high-tech, modern approach will never replace the relationships we develop with Toowoomba families. Our team is passionate about beautiful, healthy smiles and treating oral conditions at the root of the problem, aiming to improve oral health for a lifetime. We focus on early diagnosis, which enables us the opportunity to present several treatment options for our patients to choose from. Digital radiographs and our intraoral cameras allow us to show patient their conditions to gain a deeper understanding of their oral health. We offer the full range of services that our families need to stay healthy. We welcome children to our practice and work with parents to create a foundation for lifelong comfort and oral health. We adjust our treatment through every stage of development, catering to the unique needs of children, adolescents, adults and elderly patients. For patients who wish to improve the appearance of their smiles, our cosmetic dentistry services provide beautiful, natural results that add confidence in every daily interaction. Tooth-coloured restorations, teeth whitening and full smile makeovers are all available at L&R Dental. Our dental practice is located at 315 MARGARET STREET TOOWOOMBA, just up from Grand Central Shopping Centre in a nice, convenient location. To help with access, we have a ramp at the entry of the practice. Off-street parking is available at the practice building. Feel free to call us on (07) 46 321 374. Our clinic hours are 8 am to 5 pm Monday to Friday, we also offer convenient evening bookings on a Wednesday evening. We accept all private health funds and have HICAPS facilities to make reimbursements easier. We welcome dental emergencies and will give you prompt gentle treatment to restore your health. On behalf of our L&R Dental team, we look forward to welcoming you to our practice.